On Saturday 14th July, Abigail, Yasmin and Leila did a mud run on the stray. Leila and Abigail started the race at 9:45 and Yasmin started at 10:00am. The race was 5K and it was very tiring but worth it. Leila was raising money in memory of her mum’s cousin and Yasmin was raising money for her Dad’s friend. A huge amount of money was raised for Cancer Research on the day. Leila and Yasmin’s favourite obstacle was the slide at the end. WE LOVED IT! 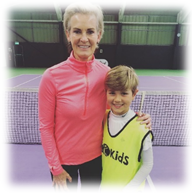 Ella Collyer and Toby Weiland were invited to train with Judy Murray at Harrogate Raquets Club. 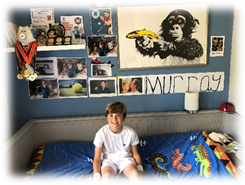 They both enjoyed this wonderful opportunity, showing off their tennis talents and learning new skills from Judy. She has certianly inspired our budding tennis stars. One day she might meet them again, but as Wimbledon competitors! Ava is part of the Women's Artistic Gymnastics squad that trains at Harrogate Gymnastics Club. She competed in a Regional Club Grade 5 competition in Catterick on Sunday, achieving a distinction. There were 47 gymnasts competing from all over Yorkshire and she placed 10th overall with 2nd place for her beam routine. Pictured with her is her coach Tracey and team mate Lili. The Dishforth Dash was run by a staff member and some of our pupils. Miss Hind ran the 10K, while Ted and Joseph (both from 4H) ran the Junior 2k race. Thank you to Ted and Joseph for cheering Miss Hind on!